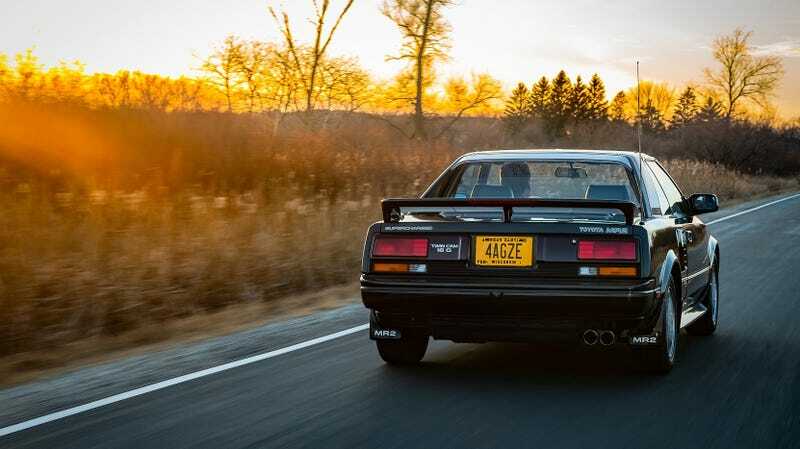 Forget about a Supra, of any generation really, because the AW11 Toyota MR2 has always been, and always will be, the real hero of Toyota’s lineup. Especially in Supercharged guise, the MR2 was a quick and fun car that lived up to its Midship Runabout name. It’s all wedges and pop up headlights and angles, which is part of the reason I will never forget how it looks. It’s an anachronistic automotive aesthetic, which I mean in the most loving way possible. Nothing else looks like an MR2. This gorgeous black example is owned by, and photographed by, Marshall Farthing. This series of pictures, taken in the fading light of a midwestern winter day, is stunning. When he sent them over to be considered for Weekend Wallpaper, I knew I had to share them with you. This black-on-bleak photo set comes to us from Marshall. You can check out more of his work on Instagram: @project4agze.